Los Angeles was the birthplace of the West Coast Blues. This session discusses the emergence of a “ballad style” piano blues and changes in the blues song form that led to the development of Rhythm & Blues. During the 1940’s, a flood of Texas blues artists relocated to California. Many of these “Texas” blues artists regularly performed and recorded in both Texas (primarily in Houston and Dallas) and in Los Angeles. A jazz scene had existed in Los Angeles since the early 1900’s and blues and jazz began to mix in the nightclubs on Central Avenue. The influential musical style of T-Bone Walker, which we’ve already discussed, was partially developed in L..A. nightclubs and recording sessions. Another influential style of West Coast Blues that emerged from the intermingling of blues and jazz in Los Angeles during the 1940s was a “ballad style” of piano blues (also known as Club Blues and Cocktail Blues), which drew upon Texas Blues, Boogie-Woogie and Big Band Swing. This style was developed by a number of pianists who had relocated to Los Angeles, including Cecil Gant (of Tennessee – 1913-1951), who had the first national hit in this style (“I Wonder” – 1944), and Texans Ivory Joe Hunter (1914-1974), and Charles Brown. The pivotal figure in the development of the “ballad style” of piano blues was Charles Brown (1922-1999) worked as pianist and vocalist for Johnny Moore’s Three Blazers during the 1940s. The relaxed vocal style of jazz artist Nat “King” Cole, whose King Cole Trio was popular in Los Angeles nightclubs, was a major influence on Brown who became the best-known practitioner of the Ballad Style piano blues. His recording “Driftin’ Blues” sold close to a million copies in 1946. Numerous performers—including Cecil Gant, Percy Mayfield, Amos Milburn, Floyd Dixon, and Ray Charles—who would make significant contributions to the development of R & B—were strongly influenced by Brown’s vocal and piano styles. 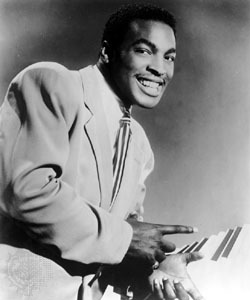 Los Angeles-based songwriters were instrumental in introducing changes in the Blues song form that were part of the development of Rhythm & Blues (R & B). Most early R & B songs used the Blues Song form with its AAB lyrical structures. This form was extended in the early 1950s by the addition of a bridge section. Los Angeles-based songwriter and performer, Percy Mayfield (1920-1984) was a pivotal figure in popularizing this song structure. His “Please Send Me Someone to Love”—also recorded by many other R & B artists—which used this song structure was one of the most influential. R & B songs of the early 1950s. Mayfield’s use of “Gospel” themes in his songwriting also became a common feature of the work of other R & B songwriters and performers. Although more associated with other parts of the country, some Los Angeles-based artists were experimenting with a harder blues style that would soon be included under the label Rock ‘n’ Roll. Some Los Angeles-based artists, such as Johnny Otis, Roy Milton and Amos Milburn, were important innovators of this harder edged style. R & B combos that performed in its harder style also put a high premium on showmanship, featuring synchronized moves and frantic stage routines. This style of performance, though not new among Blues artists, would cause a major sensation in the mid-1950s as R & B became popular with young White listeners and a new offshoot of R & B, Rock ‘n’ Roll, became a national sensation.